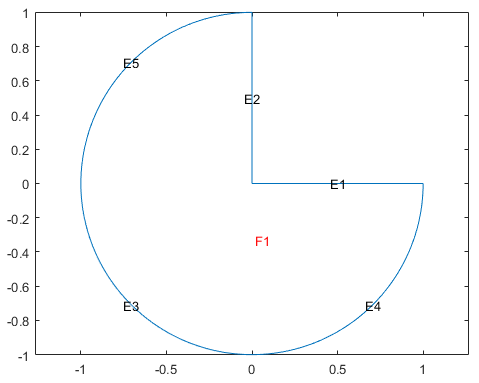 dl = decsg(gd,sf,ns) decomposes the geometry description matrix gd into the geometry matrix dl and returns the minimal regions that satisfy the set formula sf. The name-space matrix ns is a text matrix that relates the columns in gd to variable names in sf. Typically, you draw a geometry in the PDE Modeler app, then export it to the MATLAB® Command Window by selecting Export Geometry Description, Set Formula, Labels from the Draw menu in the app. The resulting geometry description matrix gd represents the CSG model. decsg analyzes the model and constructs a set of disjointed minimal regions bounded by boundary segments and border segments. This set of minimal regions constitutes the decomposed geometry and allows other Partial Differential Equation Toolbox™ functions to work with the geometry. Alternatively, you can use the decsg function when creating a geometry without using the app. See 2-D Geometry Creation at Command Line for details. To return all minimal regions (sf corresponds to the union of all shapes in gd), use the shorter syntax dl = decsg(gd). [dl,bt] = decsg(___) returns a Boolean table (matrix) that relates the original shapes to the minimal regions. A column in bt corresponds to the column with the same index in gd. A row in bt corresponds to the index of a minimal region. You can use bt to remove boundaries between subdomains. Create a 2-D geometry in the PDE Modeler app, then export it to the MATLAB workspace and decompose it to minimal regions by using decsg. Start the PDE Modeler app and draw a unit circle and a unit square. Enter C1-SQ1 in the Set formula field. Export the geometry description matrix, set formula, and name-space matrix to the MATLAB workspace by selecting the Export Geometry Description option from the Draw menu. Decompose the exported geometry into minimal regions. The result is one minimal region with five edge segments: three circle edge segments and two line edge segments. View the geometry. Display the edge labels and the subdomain labels. For comparison, decompose the same geometry without specifying the set formula sf and the name-space matrix ns. This syntax returns the union of all shapes in the geometry gd. Enter C1+SQ1 in the Set formula field. Export the Geometry Description matrix, set formula, and Name Space matrix to the MATLAB workspace by selecting the Export Geometry Description option from the Draw menu. Decompose the exported geometry into minimal regions. Because the geometry is a union of all regions, C1+SQ1, you can omit the arguments specifying the set formula and name-space matrix when using decsg. Remove the subdomain boundaries by using the csgdel function. For a circle, the first row contains 1. The second and third rows contain the x- and y-coordinates of the center. The fourth row contains the radius of the circle. For a polygon, the first row contains 2. The second row contains n, which is the number of line segments in the boundary of the polygon. The next n rows contain the x-coordinates of the starting points of the edges, and the n rows after that contain the y-coordinates of the starting points of the edges. For a rectangle, the first row contains 3, and the second row contains 4. The next four rows contain the x-coordinates of the starting points of the edges, and the four rows after that contain the y-coordinates of the starting points of the edges. 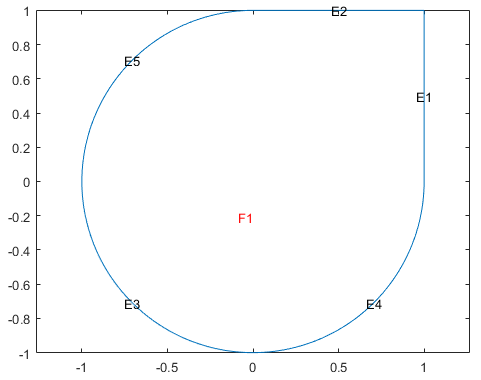 For an ellipse, the first row contains 4. The second and third rows contain the x- and y-coordinates of the center. The fourth and fifth rows contain the semiaxes of the ellipse. The sixth row contains the rotational angle of the ellipse, measured in radians. All shapes in a geometry description matrix have the same number of rows. Rows that are not required for a particular shape are filled with zeros. When you export geometry from the PDE Modeler app by selecting Export Geometry Description, Set Formula, Labels from the Draw menu in the app, you can use any variable name for the exported geometry description matrix in the MATLAB workspace. The default name is gd. Set formula, specified as a character vector or a string including the names of shapes, such as C1, SQ2, E3, and the operators +, *, and - corresponding to the set operations union, intersection, and set difference, respectively. The operators + and * have the same precedence. The operator - has a higher precedence. You can control the precedence by using parentheses. When you export geometry from the PDE Modeler app by selecting Export Geometry Description, Set Formula, Labels from the Draw menu in the app, you can use any variable name for the formula in the MATLAB workspace. The default name is sf. Name-space matrix, specified as a matrix of double-precision numbers. The number of columns corresponds to the number of shapes used to construct the geometry. Each column in ns contains a sequence of characters padded with spaces. Each character column assigns a name to the corresponding geometric object in gd, so you can refer to a specific object in gd in the set formula sf. When you export geometry from the PDE Modeler app by selecting Export Geometry Description, Set Formula, Labels from the Draw menu in the app, you can use any variable name for the name-space matrix in the MATLAB workspace. The default name is ns. For circle edge segments, the first row is 1. The eighth and ninth rows contain the coordinates of the center of the circle. The 10th row contains the radius. For line edge segments, the first row is 2. For ellipse edge segments, the first row is 4. The eighth and ninth rows contain the coordinates of the center of the ellipse. The 10th and 11th rows contain the semiaxes of the ellipse. The 12th row contains the rotational angle of the ellipse. All shapes in a decomposed geometry matrix have the same number of rows. Rows that are not required for a particular shape are filled with zeros. Boolean table relating the original shapes to the minimal regions, returned as a matrix of 1s and 0s. In rare cases decsg can error or create an invalid geometry because of the limitations of its algorithm. Such issues can occur when two or more edges of a geometry partially overlap, almost coincide, or are almost tangent. decsg does not check the input CSG model for correctness. 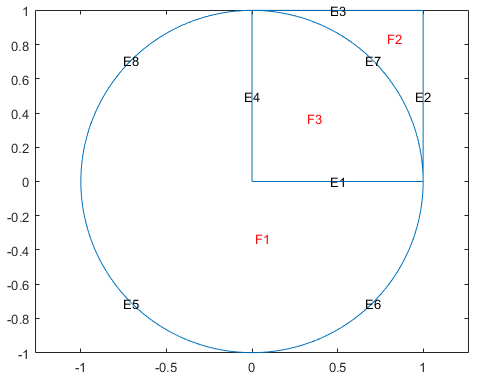 It assumes that no circles or ellipses are identical or degenerated and that no lines have zero length. Polygons must not be self-intersecting. Use the function csgchk to check the CSG model. decsg returns NaN if it cannot evaluate the set formula sf.